Introduce you a cool and multi-purpose vape kit from Vaptio – Super Bat. With the unique bat hero appearance and high-end handcraft, it’s composed of a SuperBat 220W mod and a 2ml/5ml Frogman tank. Vaptio Super Bat is a dual 18650 mod with 220 maximum output and advanced VW/TC modes for powerful vaping. 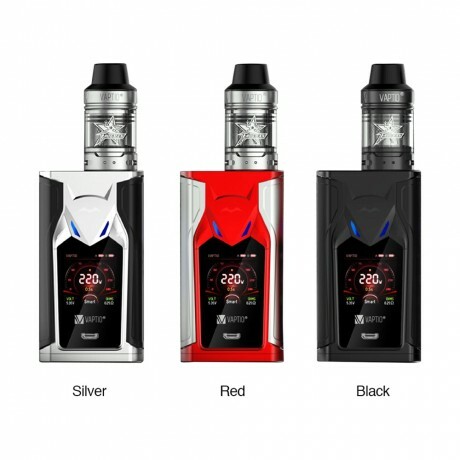 It features colorfully customized LED lighting system and 1.3 inch high-definition screen with fingertip control, which brings you a cool yet safe vaping experience with easy operation. The Frogman is a convenient top filling tank with TPD version of 2ml and Standard version of 5ml. It adopts powerful Frogman coils for huge clouds and awesome flavor. If you’re looking for a powerful kit with cool appearance, this Vaptio Super Bat is definitely the one you can’t miss.